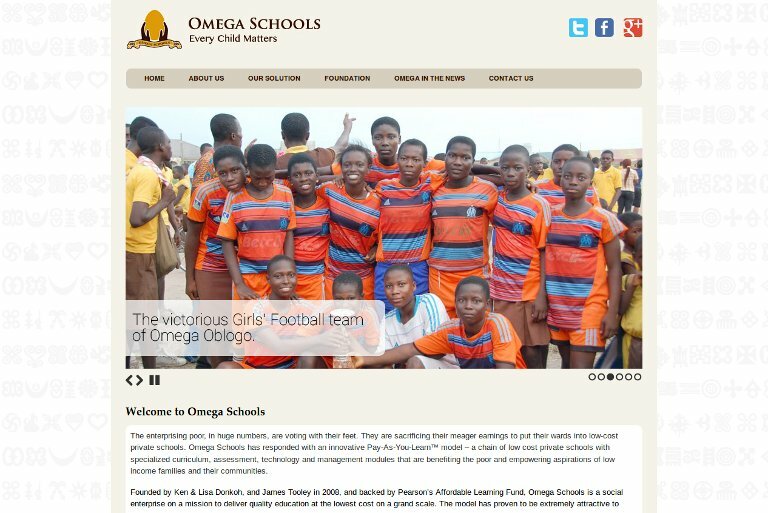 Omega is a privately held chain of for-profit, low cost private schools. It was developed by entrepreneur Ken Donkoh and Professor James Tooley, pioneer in the low-cost private school field. Taking a “pay as you learn approach”, Omega Schools offer a low-cost, scalable model for private education in the developing world. Their mission is to bring quality education to as many children as possible; thinking that it is possible for a private company to educate the poor at a profit, and provide high quality education at the lowest cost possible. Omega Schools is partnering with school proprietors to create a sustainable large chain of branded low-cost private schools in Ghana. They are bringing private sector investment to the hundreds of low-cost private schools, dramatically enhancing their financial and educational performance. Their ultimate goal is to delivering quality educational services at the lowest cost on a grand scale. The model is founded on partnership with existing low-cost schools, a strong national brand and an innovative curriculum. This combination offers school proprietors a clear and compelling value proposition that can be delivered at low cost on an unprecedented scale. The partnership with local educational entrepreneurs harnesses and unleashes their talent, experience and energy in empowering aspirations at the bottom of the pyramid. They are developing a strong aspirational national brand, positioned within the value systems of the ‘bottom of the pyramid’ market, which would tie our family of schools together. It is the first in this sector, transforming the existing low-cost school model by offering parents a quality guarantee and entrepreneurs immediate value. Children improved on test score after just a month on their curriculum. They have also been able to support two private school owners to build a more sustainable school business and to secure loans from local micro finance institutions.